The long knitting project I nicknamed the “sampler sock” project (Nancy Bush’s Little Child Sock) is finally finished. I love how they fit. I love how they feel. I’m not sure I love the “flashing” of up near the cuff, but that will get covered by jeans. I can finally dunk these in the wool wash and get them ready for when Autumn’s brisk breezes blow. I may want to backwards engineer anklet socks from this pattern. A pair would make a sweet gift for a family member with similar size feet. 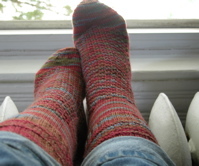 I would definitely want to use plain sock yarn (which I would need to acquire) to show off the stitch pattern. Put these in the can, folks. That’s a wrap.